Choose a pillowcase for your little girls dress. A lightweight cotton or linen pillowcase makes a great girls summer dress and a heavier fleece or flannel pillowcase is great for fall. Wash, starch and iron the pillowcase. Starching and ironing the pillowcase will make it easier to cut, especially if it's very soft. Iron it flat like a pancake and then proceed with your girls dress. Measure the desired length of the dress, beginning at the girl's collarbone. 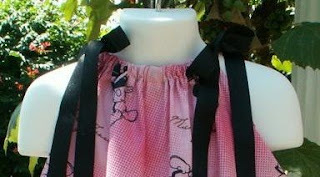 The wide hem of the pillowcase will be the bottom of the dress with this girls dress pattern. Make a pencil or chalk line on the pillowcase to reflect the desired length plus one inch . Start measuring the pillowcase from the bottom and mark the line all the way across the width of the pillowcase. Mark cutting lines for the armholes. These will be shaped like the letter "J" on the left side of the dress and a backwards J on the right side of the dress. These should be 3-4 inches deep, depending on the size of the child. This is a sleeveless dress. Fold and press both sides of the the top (neck) part of the pillowcase 1/4 inch from the top and then again at 3/4 inches. Stitch along the first fold, to make a casing for the ribbon (I prefer grosgrain), like a tunnel. Thread 1 yard of ribbon through each casing and leave enough to tie at bow at each shoulder. It will gather together and form a nice pretty neckline. You can trim the left over ribbon off to your desired hanging length. Fold, press and pin the arm holes as binding. Sew the seam and Viola. 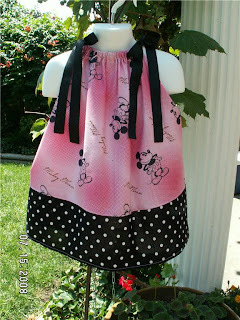 A beautiful summer dress in less than 30 minutes! Embellish the bottom with ric-rac, ribbon, fringe or whatever your hearts desire!corative embellishment.